Great reason to celebrate, I finally learned how to do a stupid screenshot! Hahaha! I don't know if my keyboard is weird or my mind is, but I found it really difficult to learn. Wasted a couple features cause of my ignorance! So yey, +10 techie points for me. It's "Pacquiao Day" today but I'm not really as excited as I used to be, his fights are becoming a little too predictable for my taste. He always wins, but I'm still watching the replay. No more pay per view for this family! 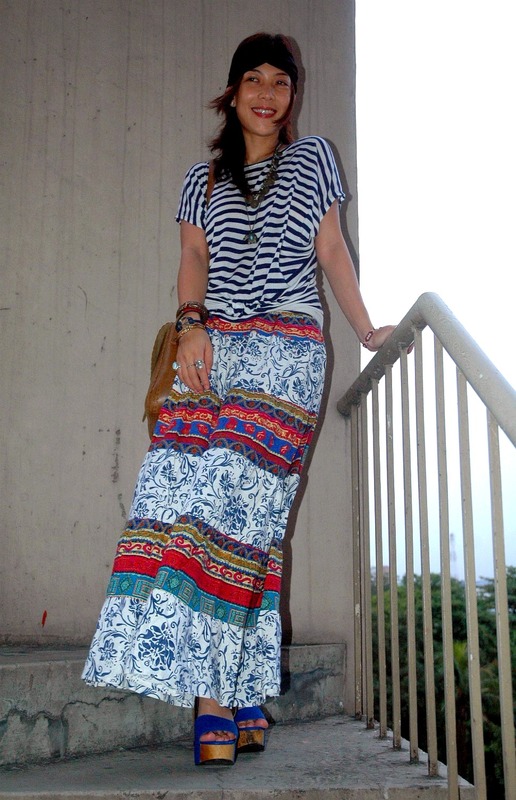 Love you maxi skirt! So fun! Those wedges are adorable! Congrats on the feature! yay! love that you know how to do the print screen na! manny won and omg! that only means more money for the family. haha! i can only imagine mommy d and her new hermes bag. OMG I looove the Maxi Skirt! bagay kaya sa akin yan?? lol lookin good! Hi! Thanks for dropping by my blog. You're pretty & I love your outfits! ;) follow each other? Gosh! those are the most gorgeous platform sandals I've ever seen! Waaaaaaa I LOVE YOUR WEDGES! They are to die for! 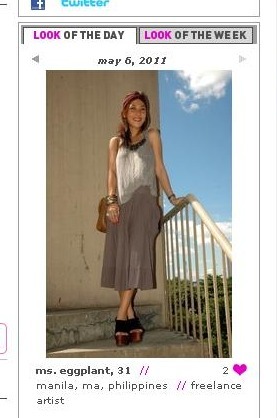 I love your skirt too, I must try wearing a maxi skirt habang summer pa! PS: I tagged you HERE! Your such a stylish mum! Happy Mother's Day to you! awesome outfit and color combo! you really are one fashionable momma! nacurios lang ako, ano ba yung "kriss-kross" style? and huzzah for the screenshots and the features! I love your sandals, so cute naman!!! Congrats on your features! I like how you're wearing horizontal stripes on both pieces of your outfit! Happy Mother's Day to this fashionable mommy! Hope u enjoyed your day! Congrats on the feature. Your maxi skirt is adorable. Happy Mother's day to you! Love the colors and mixed prints! That outfit is SUPPERRRR fun! Love this outfit and those shoes are to die for! Loving the way you've mixed the stripes & florals.....& those shoes are wow!! OMG! You look so amazing , so bohemian chic! Love this look from head to toe! 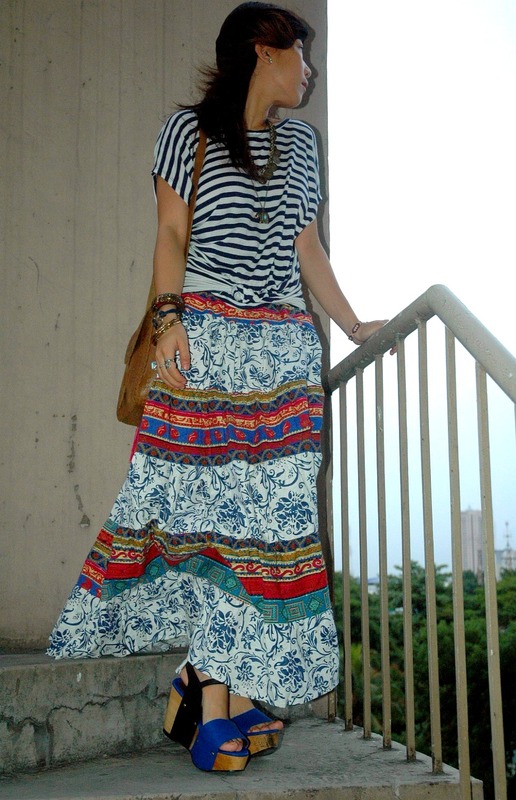 I would never have thought of mixing that skirt with stripes, but you totally make it look effortless. Those shoes are great! Really loving open platforms as of late. small kine drooling over those shoes!! they are FAB! love the maxi, too! 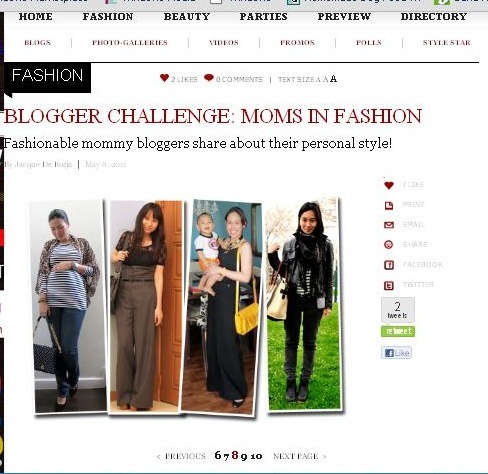 you're the second fashion mom i've encountered on the internet. 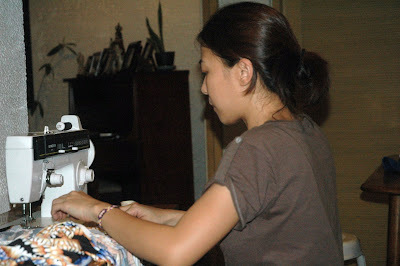 i admire moms who have the time to keep their selves pretty and stylish. I love your outfit, specially the skirt!